Reflect on tradition this Christmas with the classic colors of red and green. 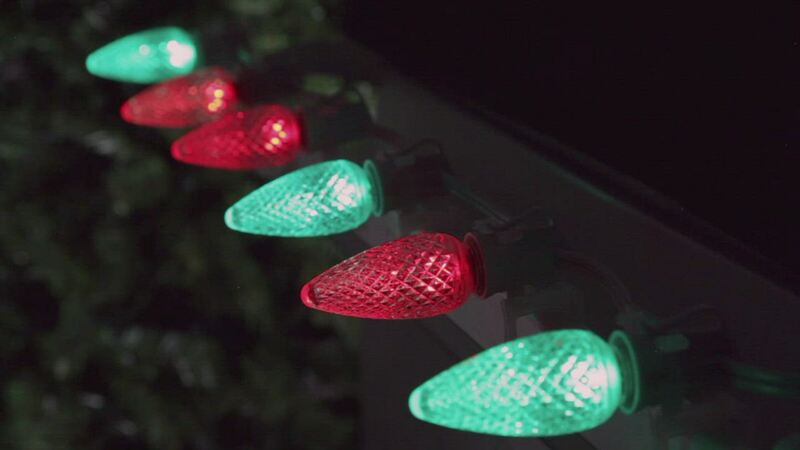 C9 red and green color change LED bulbs feature vibrant hues of Christmas past, present and future. These vintage Christmas colors stand the test of time just like our energy efficient, virtually unbreakable LED bulbs so you can enjoy a brilliant display of holiday cheer on your roof and trees for many Christmas's to come! Red/Green C9 color change LED bulbs, E17 base. Create something wonderful with inspiring color changing LEDs. These lights are great. The five diodes are really bright. Best price I've seen for color change LED C9s. Wow! They look fabulous on my spruce! Highly recommend! Very satisfied with the product. I purchased several thousand C9 LED Bulbs to allow our company to move to a led light option. The colors are bright and very true. We saved several hours in bulb replacement time, compared to traditional LED bulbs. We are looking forward to being able to customize our color patterns and to change them as we desire. Bulb Dimensions: 1.18" bulb diameter, E17 - Intermediate base size Lights: C9 LED Green, Red, Faceted Acrylic, Non-Dimmable, Color Change, Nickel base.